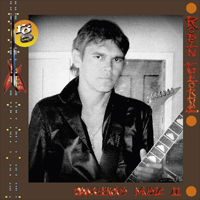 ROBIN GEORGE enjoyed a worldwide hit single in 1985 with “Heartline” and his stock was high as he entered the studio to record a follow up to his critically acclaimed album “Dangerous Music”. The album had the working title “Dangerous Music II” and was produced by acclaimed producer GUS DUDGEON. By the end of 1986 the album was completed and ready to go but his then management company went to market and because of the success of “Heartline” sought ridiculous advances and as such the album was never released-until now. The band recording the album broke up and Robin then formed NOTORIOUS with former Diamond Head frontman SEAN HARRIS (released on Angel Air “Radio Silence” SJPCD332). If you loved the first Dangerous Music album, this sequel doesn't stray too far from that formula, which for most will be a good thing (don't fix what ain't broke!) George's high pitched, melodic vocals and crunchy guitar work permeate these catchy, glossy pop/rock tunes, with songs like "Dangerous Music", "Heart to Heart", "Streetwise", the Robert Plant sounding "Don't Come Crying", and the charming synth pop number "Machine" really standing out. "Ace in My Hand" really rocks hard, complete with George's metallic riffs and blazing solos (he's a vastly underrated guitarist), and the intoxicating "Red For Danger" is a can't miss track, and no surprise that Robert Plant himself chose to cover it on his Sixty Six To Timbuktu album. Thanks to Angel Air, this very fine album can now be enjoyed by everyone who has been waiting for its official release for a very long time. Hearing this now, the fact that this album was never released seems particularly sad...because there are several songs that could easily have been huge hits. The track that seems like it would have been the perfect hit single is "Heart To Heart"...this one could've been huge. Produced by Gus Dudgeon, these tracks have a great big slick sound. Robin's fans will certainly be pleased that this one has finally resurfaced. Robin has a great pedigree playing with amongst others. Phil Lynott, Robert Plant, Roy Wood and Diamond Head. Dangerous Music 11 is clearly an Eighties production, I can imagine some of the tracks playing in scenes from Miami Vice, glossy synth pop overladen with Robins guitar work. Listening to this now, the fact that this album was never released seems like a crime, this is the album that could have turned Robin into a household name, as there are several songs on here that could easily have been huge hits for him. Has this been worth the wait, if you are a Robin George fan, than absolutely? Go out and buy it, you will not be disappointed. ...demos as they are, these 17 tracks retain their potential even after almost three decades of shelf life.